This major exhibition (26 September 2018-6 January 2019) brings together sculptures and installations that explore perception and space. Featuring 20 artists and spanning a period of roughly 50 years, the exhibition includes innovative, minimalist sculpture from the 1960s as well as recent works that extend the legacy of this 'optical' minimalism in different ways. 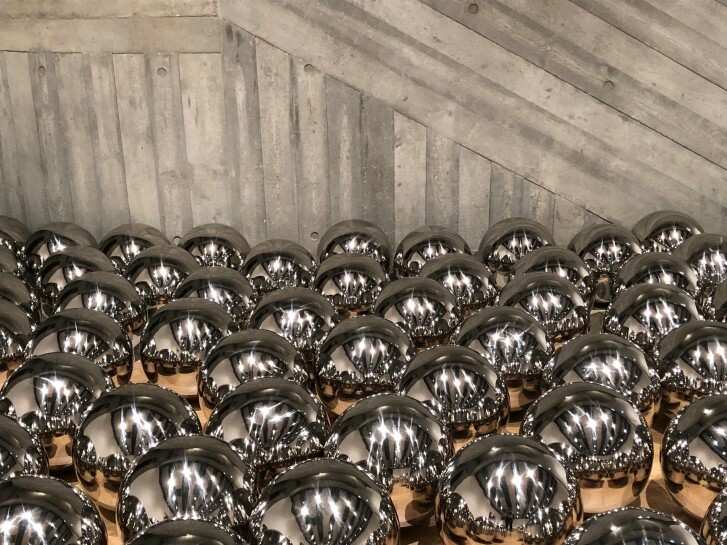 Yayoi Kusama's seminal installation Narcissus Garden originated in 1966, when the artist first participated, albeit unofficially, in the Venice Biennale. This expansive and immersive work comprises mirrored spheres displayed en masse to create a dynamic reflective field. Regarded as pivotal in Kusama's career, Narcissus Garden anticipates many of the radical performances that would become a focus of her time in New York during the late 1960s, while encapsulating key aspects of Kusama's wider practice - allusions to microscopic and macroscopic worlds, a preoccupation with the infinite and sublime - that remain compelling in her art to this day. as the subject of the work. Visit the Hayward Gallery website.